Youre the competitive advantage. If you dont keep your professional edge sharply honed, how can you and your company continue to succeed? Who else is going to plan your professional growth for you? Good news! 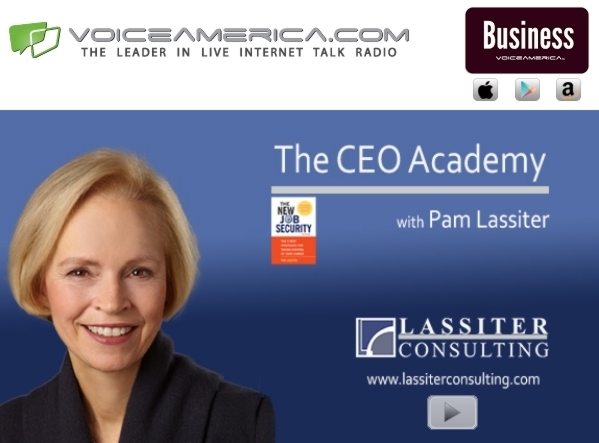 Pam Lassiter, your host on CEO Academy, is your partner and she is here to help you stay ahead of the game. Our show addresses your most pressing questions about setting up your success. How do you develop a plan for becoming the CEO? How do you scale your company to international success? How do you negotiate and influence on behalf of yourself and your stakeholders? How do you motivate your employees and the company to follow your leadership? When and how do you shift your leadership style? Whether you are currently a CEO or are on your way to becoming one, having the right answers to these questions will set you apart as a leader. Well cover these topics and others related to your professional growth on your trusted source for career success. The theme running through all of these topics: CEOs need to change skills sets constantly. Staying ahead of your industry, changing your leadership style for different situations, and continual learning fast are the norm. How do you do maintenance on the plane (you) while it's mid-flight? Larry has predicted the future multiple times then created companies and books to bring us there. What do you need now to be ready for your future as CEO? "Graceful transitions" as you become a CEO, leave being a CEO and retire are essential. They determine your reputation and relationships. Read CEO Transitions: The Science of Success on the McKinsey website. "Being approached" by a search firm is more strategic than emailing them you're available. How do these firms work? Can they be of help to the executive job seeker? Read How Search Firms Find Senior Executives. There are multiple ways to grow your company within your current structure. The rewards are often greater and lower risk than growing by acquisition. Read Creating an Organic Growth Machine on the Harvard Business Review. Board member or chair: 3 public boards + private and non-profits. Is it time for you, as CEO, to be on a Board? If so, which one(s) and how? Structuring your own Board wisely contributes to your success. Look at Stairsteps for Building Board Experience. How does social media fit in your corporate strategy and what are its risks and rewards for you and your Board? Read Even CEOs Need to Use Social Media on the Fast Company website. Maria Kussmaul advises major corporations as well as countries, the military, and you on best practices in the growing necessity of cyber risk management. Read Are You Protecting Your Crown Jewels?. What are You Worth as CEO? Tom works with boards and top executives nationally to design total compensation plans starting from the top, the CEO, and aligning compensation and reward programs with key drivers of the business. Read What's Your Market Value? "Why Should Anyone be Led by You?" Dr. Eglen's oversight of 3000+ employees at Corning incorporates some of Goffee & Jones's qualities for inspirational leaders + best practices he's shaped from start ups to major corporations. Rick Burnes has supervised some of the most successful CEOs in the US who started their companies with CRV funding. What you don't know yet will soon change. John Humphrey has co-founded seven organizations, taken 2 to global prominence in different industries and had 3 acquired. When and how to scale your company is the focus. Dr. Bose is connecting the unconnected with broadband coverage around the globe. As the CEO for 20 years, Dr. Bose shares ideas about how to become and remain a competitive leader.